Gold Rhinestone Halo Headband by The Ivory Willow at Nicky's Blog. Hurry! Limited time offer. Offer valid only while supplies last. This gold halo headband features clear sparkly rhinestones so that your halo headband is the perfect addition to your child or flower girl's outfit. 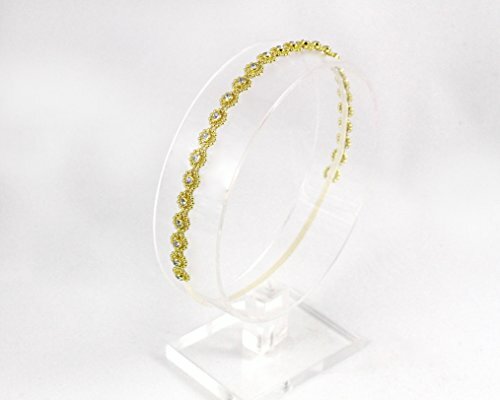 This gold halo headband features clear sparkly rhinestones so that your halo headband is the perfect addition to your child or flower girl's outfit. The beautiful and sparkly headband is bright yellow gold-tone and made with a string of clear rhinestones that measure approximately 3/8". It is attached to a 1/8" skinny elastic headband in the color of your choice. This headband can be worn as a halo headpiece or the traditional way, up and over the top of the head. This is an amazing photography prop. It's delicate yet eye catching. This is beautiful for babies, children and adults. It would be the perfect accessory for Prom or a beautiful headpiece for a wedding. The elastic color can be changed to match your hair color or an outfit on request as well.